Program 8, the final production in San Francisco Ballet’s eightieth anniversary celebration, is the one Bay Area ballet fans have been waiting for. The US premiere of Christopher Wheeldon’s fairy-tale ballet was SFB’s flagship offering this season. And, “Cinderella” did not disappoint; all the hype was spot on. Everything about the three-Act narrative was absolutely grand - from the sets to the visual effects to the orchestrations to the costuming to the performances to the choreography – it is the SFB event of the year! Just as it was with Artistic Director Helgi Tomasson’s re-vamping of “Swan Lake” for SFB in 2009, Wheeldon’s decision to include a Prologue in his “Cinderella” was genius. The ballet begins by introducing us to the two main characters (Cinderella and Prince Guillaume) as children. This provides imperative insight into their history, helping the audience understand what early life events they experienced and how these continue to inform their lives as young adults. With Cinderella, we see her as a child enduring her mother’s death and her father’s subsequent marriage to another woman (and a very unfriendly one at that), Hortensia. We meet Prince Guillaume as a young boy playing with his friend Benjamin - happy, joyful and carefree. His father King Albert quickly puts a stop to his childhood fun by reminding him that his life is about responsibility and duty, nothing more. With these short prologue scenes, Wheeldon reveals how much these two individuals have in common, which further explains why they are so drawn to each other later in the ballet. The grown-up Cinderella and Prince Guillaume (the incomparable Vanessa Zahorian and Davit Karapetyan at this performance) share a deep sense of fear. Her, a fear of letting herself love someone who may not always be there and he, a fear of being controlled by situations, by circumstances and by other people. As evidenced by the following two hours and fifteen minutes, fear is a common denominator for them but it is by no means the entire narrative of their love story. It is simply an important piece of the puzzle that is rarely seen or heard. Transformation is the name of the game as Cinderella is readied for the ball. Accompanying this conversion-moment are four lovely divertissements, beautifully danced and exquisitely choreographed. By merging traditional and contemporary ballet vocabulary, Wheeldon is able to speak and physically re-create the essence of the four seasons – Spring’s sprightly blossoms, Summer’s extended sunsets, Autumn’s dynamic changes and Winter’s delicate flutter. As the ball commenced (and Act II began), the audience was treated to a delicious collection of sensibilities. We began with the stately, regal and elegant corps de ballet in the partnered social dancing sequences. Then came much humor. The three princesses who are brought to ‘woo’ the Prince were all outrageously funny, though Courtney Elizabeth kind of stole the show as the Russian Princess. Cinderella’s Stepmother (Shannon Rugani) had an equally hilarious drunk dance; while the two Stepsisters (Dana Genshaft as Edwina and Clara Blanco as Clementine) were comic gold from beginning to end. Blanco’s Clementine evolved over this scene as she became smitten with Benjamin (Hansuke Yamamoto) and he with her. It was a nice touch for both characters; a sense of humanity in her, and sincerity in him. Cinderella and Prince Guillaume’s pas de deux at the ball was everything it should have been – youthful, joyous; full of expectation. In each of their variations, a willingness to move forward was prevalent. Wheeldon peppered Cinderella’s choreography with various iterations of fourth position, indicating an openness to the future. Possibility could have easily been the title for the Prince’s solo with its plethora of circular jumps and leaps. I also really appreciated how “Cinderella” was not about hyperextensions, super high legs or circus tricks. Wheeldon’s choreography served the story in an honest and humble way; just one of the reasons why this particular production of “Cinderella” was so good. Act III was short and sweet as the Prince searched the kingdom for his one true love; the foot that fit the golden shoe. As the curtain fell and the orchestra played its final chord, it was clear that Cinderella and Prince Guillaume had moved past their fears and had found love, happiness and most important, a sense of peace. 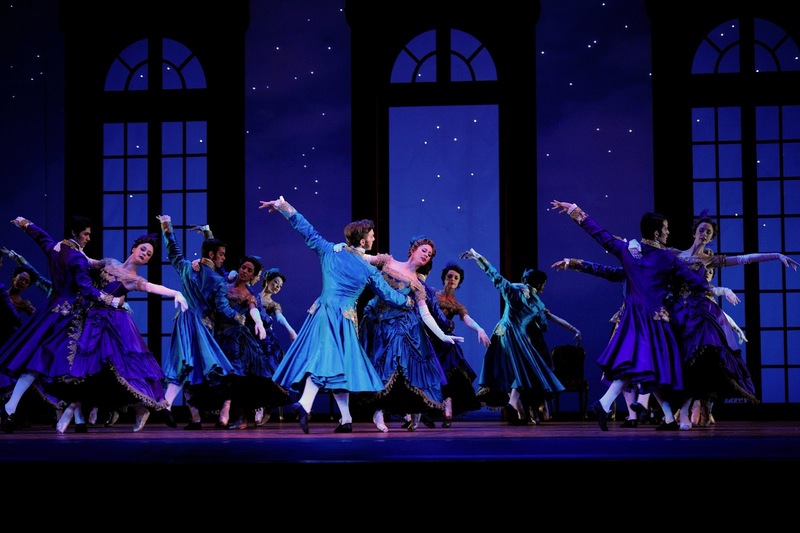 As expected, the entire run of Christopher Wheeldon’s “Cinderella” is sold out at San Francisco Ballet. But, if you didn’t get a chance to see the maiden and the prince get their ‘happily ever after’ this year, you will have another opportunity. SFB has added the ballet to its 2014 season (the fourth program). Get your tickets for next year’s performance as soon as humanly possible; it is a must-see!